Recently, CBS Sunday Morning went behind the scenes in our firearms collection to learn about the history of firearms in the United States. Intern Casey Inks shares two intriguing objects that you may not have seen on the show. When I learned that I was selected for an internship working with the National Firearms Collection at the National Museum of American History, I was ecstatic. My family taught me gun safety at a young age and I enjoyed participating in clay target sports as part of the Hillsdale College Shotgun Team. Throughout my years as a competitive shooter I had seen many beautiful guns, but I knew that working with the National Firearms Collection would bring many more before my eyes. While working with the collection in the secured storage area known internally as the "Gun Vault," I came across two rifles that grabbed my attention. When I learned that the two guns had been used in a duel between two Congressmen—Representative Jonathan Cilley of Maine and Representative William Graves of Kentucky—I was shocked. I immediately wanted to learn more. The rifle used by Cilley is a percussion rifle, made by Tryon of Philadelphia, Pennsylvania. The rifle is .38 caliber and features a 35.5-inch-long, octagonal barrel. My favorite part of the rifle is the tiger-striped maple stock. The stock's glossy look makes the different tones of the wood pop. In the stock is a patch box, which is a small vessel that holds a piece of cloth used to load the rifle. 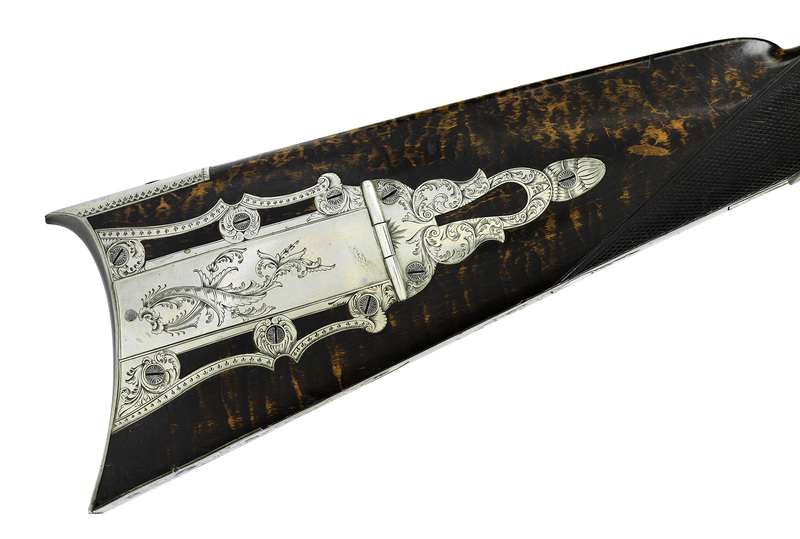 The silver patch box cover of Cilley's rifle displays intricate, floral etchings. Similar designs decorate the rifle's lock assembly. The overall look is one of elegance. The rifle used by Graves, which he had borrowed, is also a stunning percussion rifle made in Pennsylvania; however, this one was made by Henry Deringer. 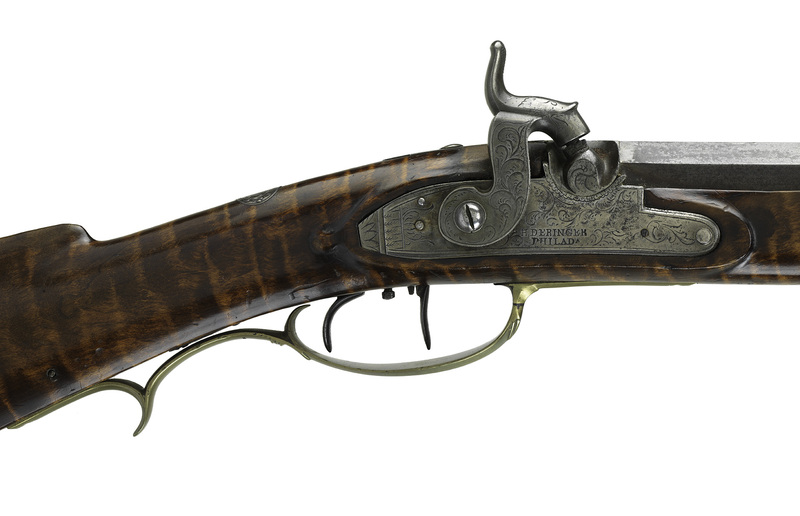 Although better known for his pistols, Deringer also built fine rifles. This .44 caliber rifle features a full stock, reaching to the end of the 45-inch-long octagonal barrel. Much like Cilley's rifle, the Deringer's stock is rich maple. Though the wood is slightly lighter in color than Cilley's, the tiger stripes are just as visually attractive. The copper patch box features ornate etchings. A small, oval silver plate on the other side of the stock shows an etching of a running deer. I enjoyed admiring the rifles' elegance but imagine they'd be a bit unwieldy to use in a duel! Cilley and Graves had no known prior grievances, but in February 1838 the two congressmen's courses collided. Their dispute began with an article in the New York Courier and Enquirer, which accused an unnamed senator of corruption. When James Watson Webb, the editor of the newspaper, faced questions regarding the article, he supported the authenticity of the claims and suggested Congress investigate. Cilley became involved by openly denouncing the credibility of the claim; his remarks were published on February 12, 1838. On February 21, Webb publicly took offense to Cilley's remarks. So how did Graves get involved? He was acting as Webb's correspondent. During the next few days, Graves tried to deliver a note from Webb to Cilley, but Cilley did not accept. That's where the dispute between the two congressmen began. Although Cilley confirmed that he meant no disrespect to Graves, he neither confirmed nor denied anything in regard to Webb's character. Graves interpreted Cilley's actions as an attack on his own honor and on Webb's character. Although dueling served as a common method of settling disputes in the early 19th century, the institution had recently come under scrutiny, presumably due to the number of worthy men lost in duels. Despite the recent aversion, many men still believed in physically defending their honor. Graves, being one of these men, proceeded to challenge Cilley to a duel. Each congressman named his dueling seconds, those who would act as mediators in making arrangements and during the coming duel. George W. Jones of Wisconsin was Cilley's second. Henry A. Wise of Virginia was Graves's second. Together, Jones and Wise hashed out the details. Cilley, Jones indicated, wished to use rifles rather than the more common choice of pistols. Graves, supposedly inexperienced with rifles, did not even own one, and he had to borrow one from John Rives—the grandfather of the man who donated the gun to the museum! On February 24, 1838, the two congressmen and their entourages arrived at the Bladensburg Dueling Grounds. As recollected by one spectator, Cilley and Graves took their places, and on the count of three fired their first shots. Both missed their targets. Despite the hopes of the two men's friends that the duel would end there, they proceeded to the next round. After the second round, a spectator noted that Graves moved like he had been shot. But when asked why, Graves simply said that the rifle had gone off before he was even ready. The duelers were once again urged to end the confrontation there, but both wished to continue into a third round. Both shots rang out, and Cilley's hand reached for his thigh—Graves had hit his mark. Cilley staggered and sunk to the ground. On the field, surrounded by his friends, Cilley took his last breath. Learning the story of Cilley and Graves gave me a new appreciation for the history of the rifles. We often admire the appearance of objects before knowing their stories, when it is the awareness of both that often makes them so fascinating. That is what is great about museums, though. They encourage you to look beyond the physical objects and learn the stories they tell. Casey Inks was a Division of Armed Forces History intern at the National Museum of American History. She studies History at Hillsdale College in Michigan and is participated in her school's Washington-Hillsdale Internship Program.